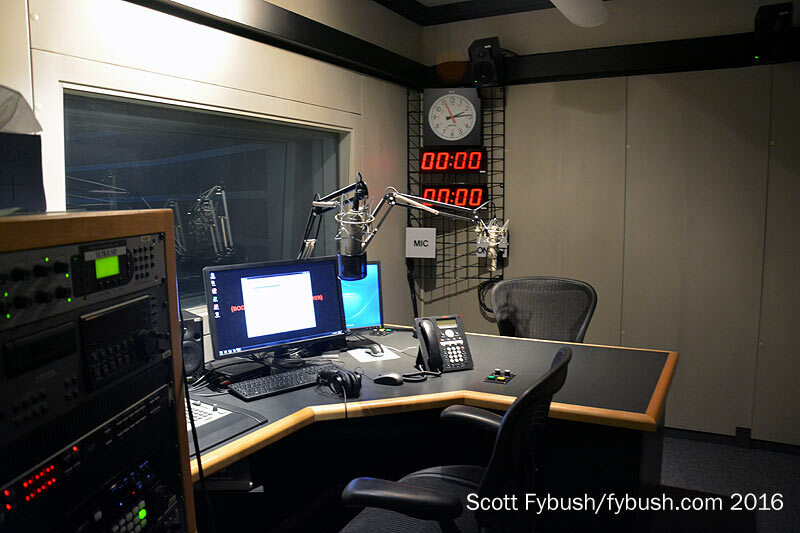 There’s a lot of good public radio to be had in Los Angeles – everything from Pacifica’s venerable KPFK to classical KUSC to world-class jazz at KKJZ to the top-notch AAA offerings at KCRW in Santa Monica. 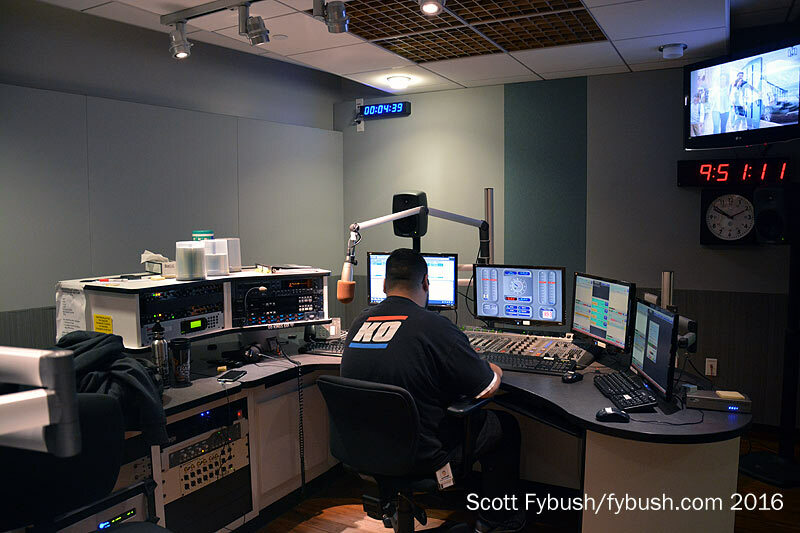 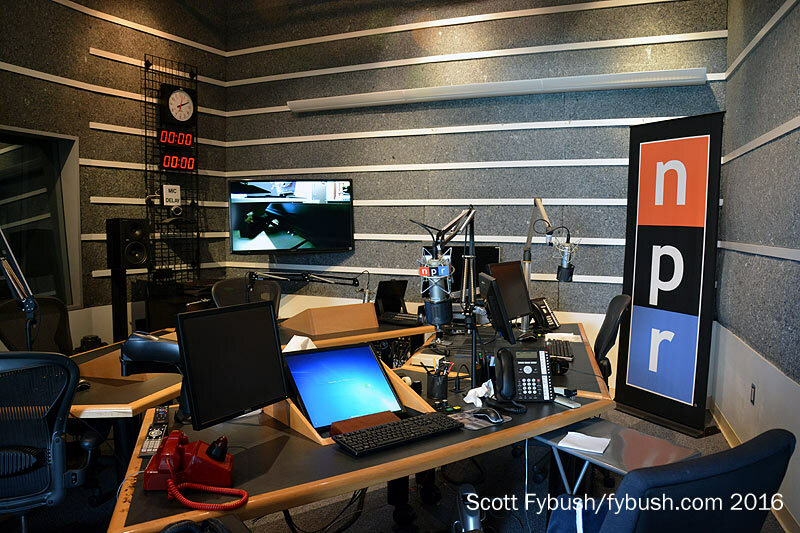 There’s national production out here, too, in the form of APM’s Marketplace, whose downtown LA studios we’ve yet to visit, and in the form of NPR West, which we saw a few years back and which we revisited in the spring of 2016. 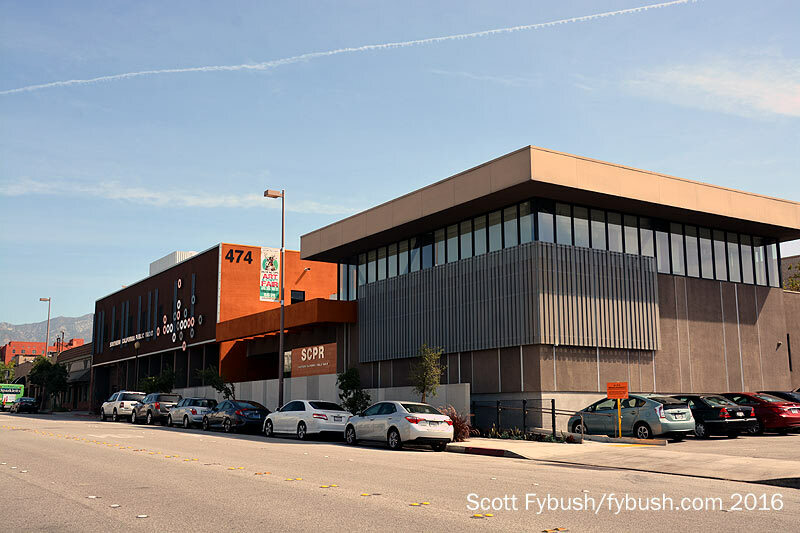 There were some new developments out here in Culver City since our last visit, including the move of some NPR hourly newscasts to anchors out here instead of headquarters in Washington. 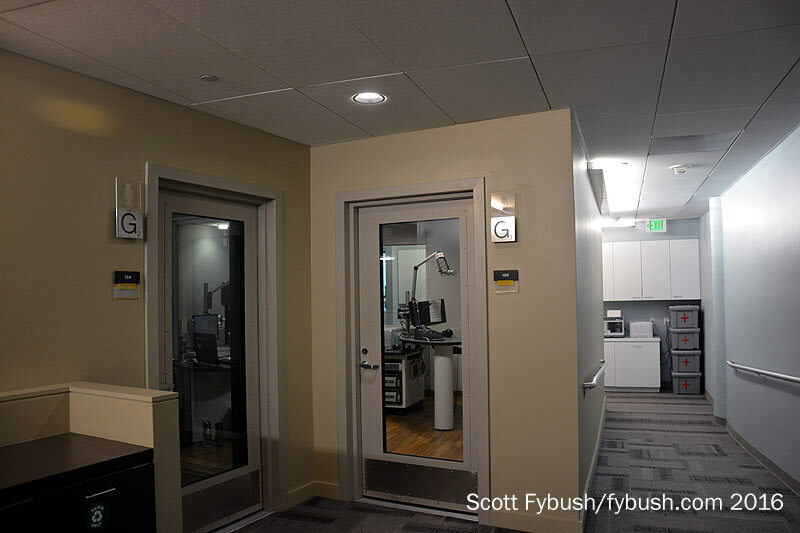 Those newscasts come from the small studio above, which is down the hall from the newsroom – which now has an operations center under construction that’s a mirror image of the big one at HQ in DC. 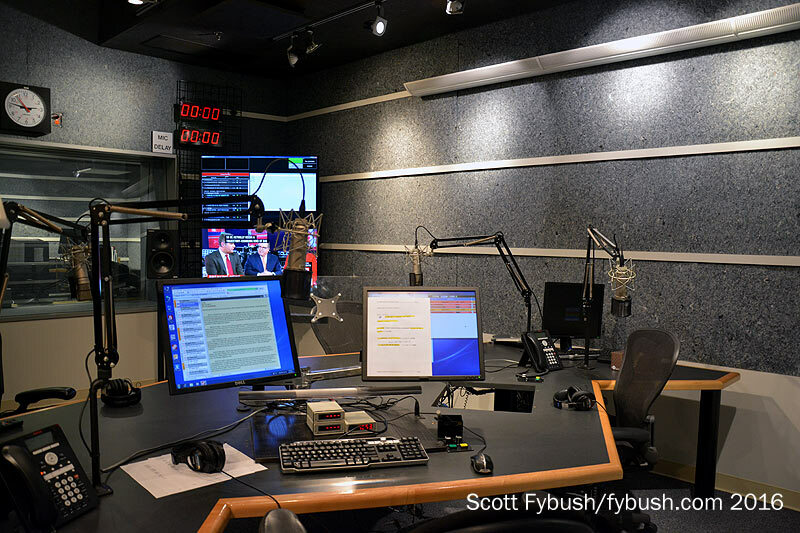 Along the perimeter of the building, we revisit several larger studios that are used for the West Coast anchors who are now a regular part of Morning Edition and of All Things Considered. 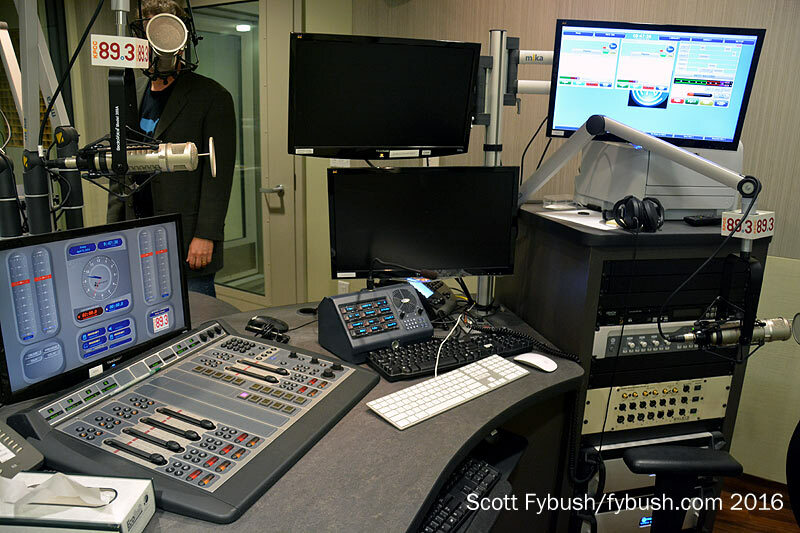 And then, it’s off through LA traffic from the west side to the east side, where we pay a call on KPCC (89.3 Pasadena), which moved back in 2010 from the Pasadena City College campus to a new $24 million broadcast center on the south side of downtown Pasadena. 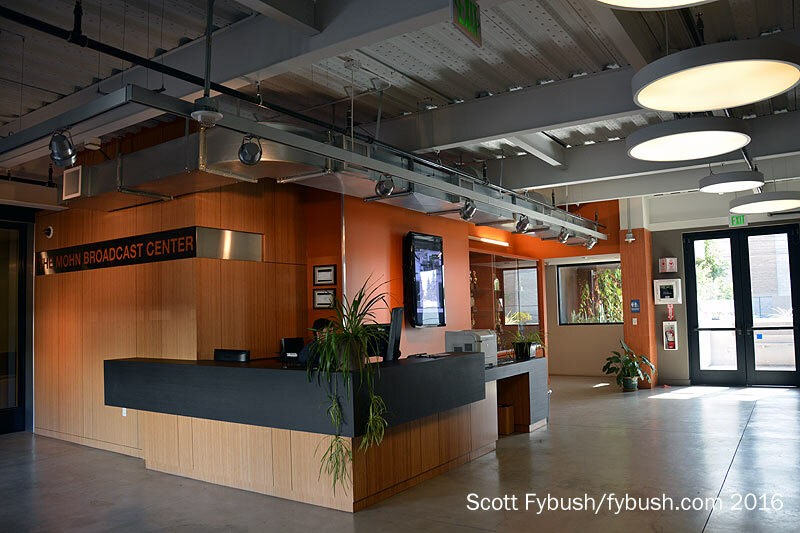 There are two buildings here connected by an airy lobby, and we start with the new construction on the south side, where there’s a spacious room that can be used for meetings, community events and live broadcasts. 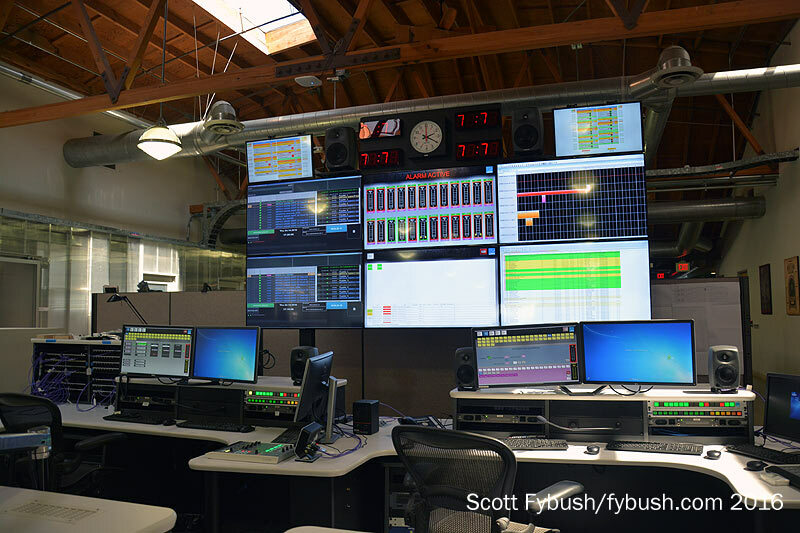 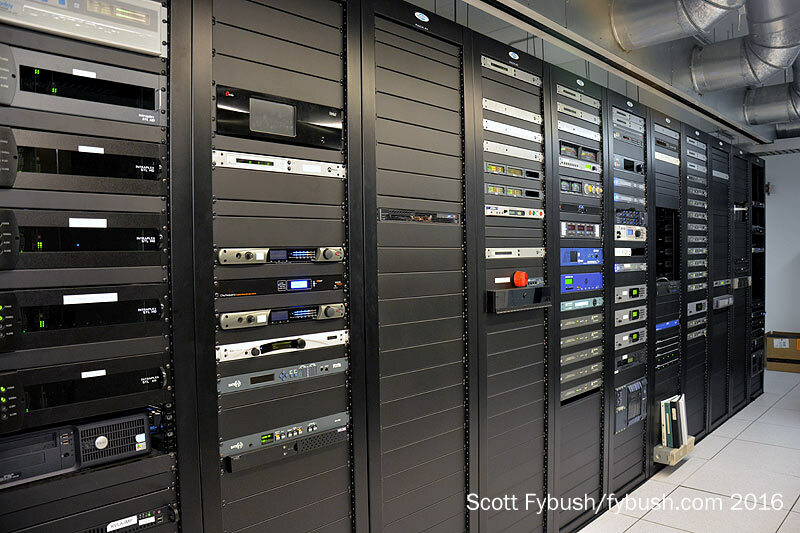 Back on the other side of the lobby, the renovated older building includes the rack room that feeds Southern California Public Radio not only to the KPCC site on Mount Wilson but to satellite stations in Palm Springs, Redlands and (more recently) Ojai/Santa Barbara. 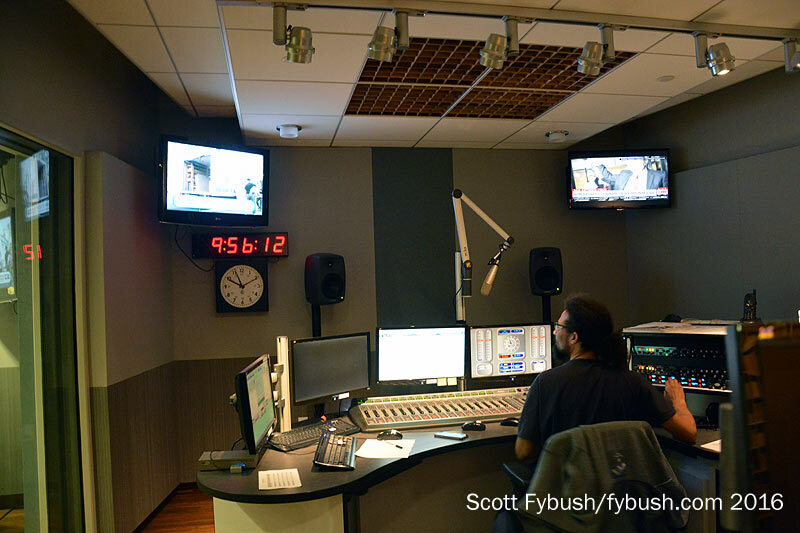 There’s a cluster of studio and control rooms on the second floor, both for live air and for production of the several daily talk shows that come out of this facility. 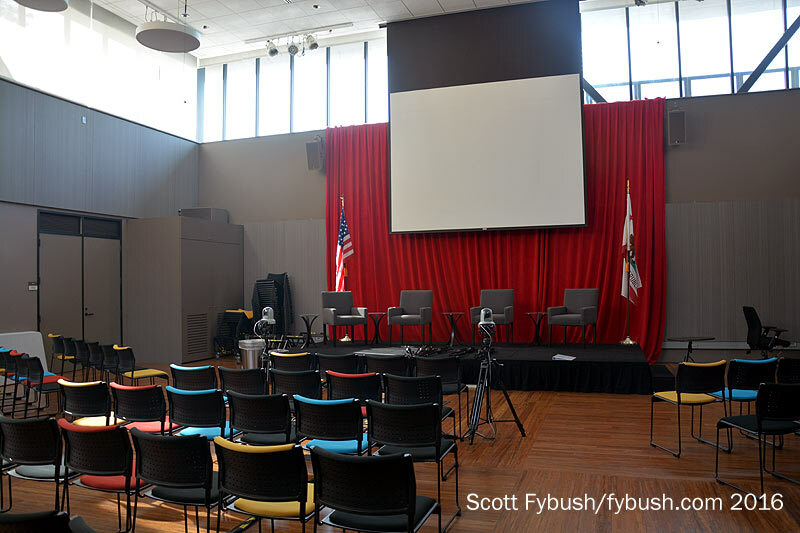 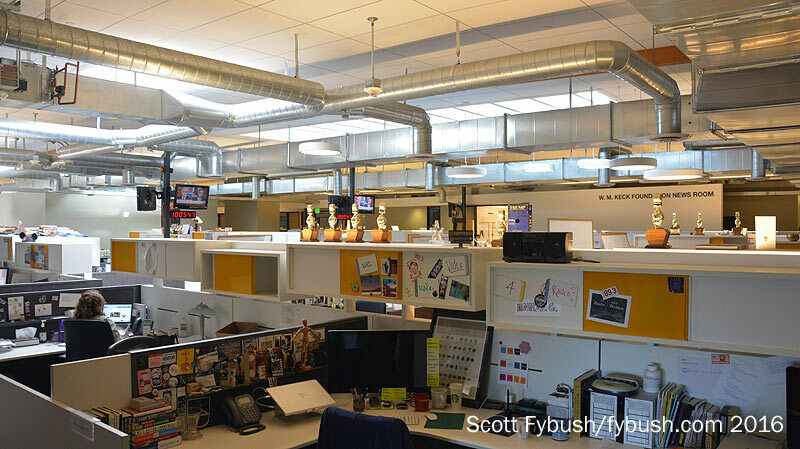 Back downstairs, there’s a big newsroom area that’s home to some – but not all – of the SCPR news staff (others are based in downtown LA, Orange County and in the Inland Empire. 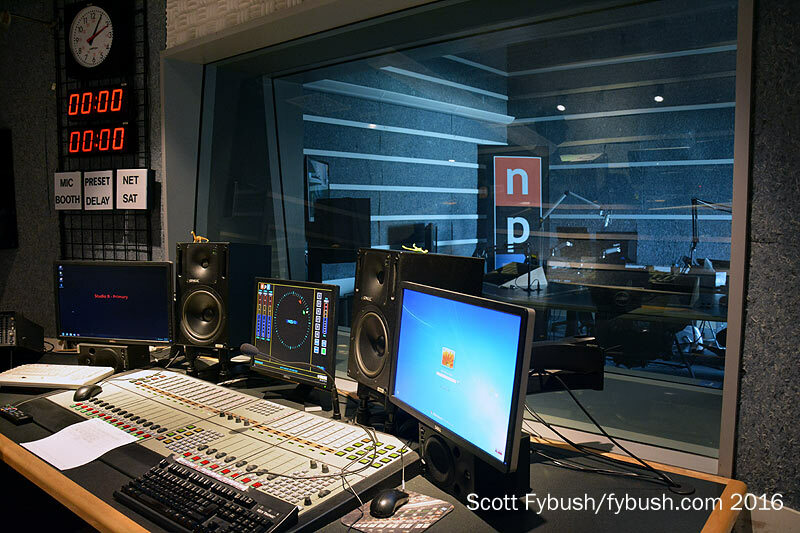 Thanks to NPR West’s Patrick Murray and SCPR’s Doug Johnson for the tours!